Making basic sausage at home is surprisingly easy if you have the right equipment and a little time. Clean & sterilize all equipment. You’ll need a grinder, mixing bowl & spatula, plus a sausage stuffer if you’re making links. Chill all equipment & keep the meat cold. When grinding you want the meat and fat to be as firm as possible. The more firm they are, the more uniform grind you will get, and the better texture your homemade sausages will have. Consider your fat ratio carefully. Sausages will hold together better and have a better texture if they have a high fat content (depending on what you’re making, as high as 25% or even more). 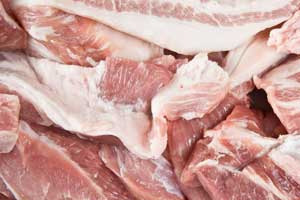 If your sausage meat is lean, extra fat can be added by grinding cubed salt pork or pork fat back along with the meat. Grind at a slow but steady pace. If cranking, try not to speed up or slow down, and don’t rush the meat through. If using a mixer attachment, use the lowest speed necessary to move the meat through the grinder. (Optional) Liberally salt the meat the day before. Doing so will act almost like a quick cure, drawing excess moisture out of the meat while intensifying its flavor. Be sure to wash the meat thoroughly before grinding. To make loose sausage at home the only special equipment you really need is a grinder. Add to that your trim of choice, plus seasonings, and you’re ready to go. For example, if making your own wild boar sweet Italian sausage from scratch, you’d need wild boar trim meat, sweet paprika and fennel seeds (about 1oz each per 10lbs of trim), plus a little sugar depending on your taste. Defrost the trim meat completely, but keep it chilled. (Optional) lightly toast any whole spices you’re using. This will increase their flavor. Toss the trim meat with your seasonings. Select the appropriate grinder die for the sausage consistency you want & run the seasoned trim through your grinder into a bowl sitting on an ice bath. 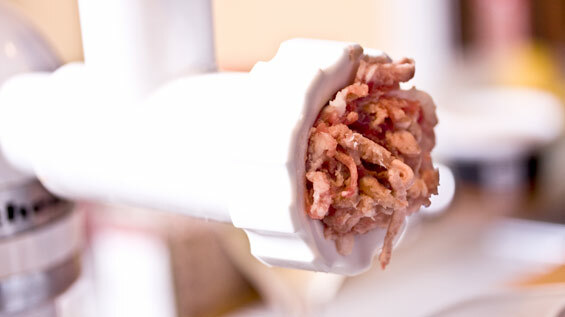 Use the plunger that came with your machine or another tool to push the meat into the gringer’s shoot, not your fingers. Using a spatula, mix the ground sausage until it’s consistent in appearance. You want to distribute the fat and seasonings as evenly as possible. (Optional) If you’ve used the smallest die and would still like your loose sausage to be smoother, use an electric mixer with a paddle attachment to whip the meat until it’s a finer consistency. Store covered in a bowl or wrapped in a tube of plastic wrap (for patties) at the bottom of your fridge (but not in the crisper or the door) until you’re ready to cook or put in casings. In order to take your loose sausage and turn it into links, you will need sausage casings. Natural casings for sausage links are usually intestines from sheep, lambs, or pigs. Pork sausage casings are the right size for traditional sausage links, while smaller lamb sausage casings are better suited to breakfast links. Edible synthetic casings are usually made from formed collagen. Many people prefer the texture that natural sausage casings provide (which is why our game sausages use them). You will probably need a sausage stuffing machine for this. The most easily available one is an attachment for stand mixers. For finely ground sausage fillings you could use a piping bag in a pinch. If using natural casings: Wash your casings (if using natural) thoroughly. Then put them in a covered container of warm water, and move that container to the refrigerator. Let pork casings soak overnight, lamb casings only need to soak for a half hour or so. If using synthetic casings: follow the manufacturer’s prep instructions. Follow all procedures above for making sausage filling. Tie one end of your casing shut with butcher’s twine, and thread the other end onto the tip of your sausage stuffer. Pack the sausage in to the stuffer’s reservoir. Extrude the sausage into the casing. As you reach the desired link length, twist the casing around to close that part of the casing off. Alternate twisting directions between clockwise and counter clockwise. Tie off the end of the casing once all links in that length are complete. (Optional) Protect against air bubbles bursting the sausage while cooking by poking tiny air holes in each link with a sanitized needle. We carry a full line of trim meat for sausage making, plus great seasoning options like whole spices and dried chiles. If you want to try specialty sausages, but don’t want to make your own, we sell high-quality game sausages too. Hey Matthew, thanks for sharing the sausage guide. I am looking to make some over this weekend.